2" x 3" Linear Suspension, Pendant, Cable Mounted Ultra-Bright High Output LED Lights up to 16 feet. 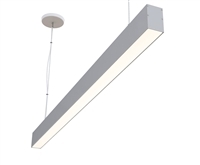 Our 2" x 3" Suspended Linear LED Fixture is one of our most popular suspended linear fixture types. Use our 2" x 3" fixture to illuminate residential or commercial spaces. Linear design makes them compatible with almost any look or space. These fixtures are suitable for residential, commercial, industrial, and office-space applications. 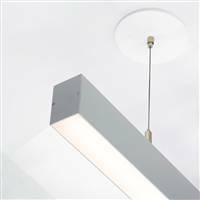 They can be suspended/cable/pendant mounted from any ceiling or surface type. These fixtures can also be surface, or recess mounted. Contact-Us for more information. Available as individual piece in 2ft, 4ft, 6ft, 8ft, 12ft, and 16ft sizes! Fully Dimmable to 1% | Standard!